If it’s adventure you seek, you’ll need to stop at Basin first. Basin Sports opened 10 days before Killington Mountain. The Torreys, who bought the business in 1991, were the third family to own and operate it. The family has made several additions over the years, including the iconic clock tower, according to Christine Torrey, who started working here in 1996 and is now running the store as her parents near retirement. The oldest ski store on the mountain – 10 days older than ‘the Mountain’ itself – Basin is chock full of adventure gear. We rented our skis from Brett, who provided outstanding customer service. Basin can gear you up, suit you up and boot you up. There’s even custom boot-fitting, with two certified pedorthists on-site. Basin has a demo pair of every type of skis they sell, so you can try before you buy. In need of ski service? They also have a Wintersteiger ski tuning machine, performing five to six hundred season tune-ups a week for their loyal customers, more than anywhere in Killington. 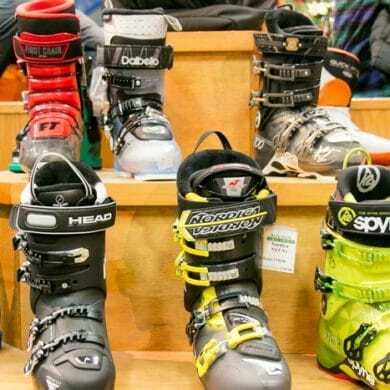 There are skis, snowboards and bikes available for purchase or rental. They also sell fine women’s, men’s and children’s clothing and gear. Basin Sports is located at 2886 Killington Road in Killington VT. For more information including a ski report and gear reviews, visit the Basin Sports website or call (802) 422-3234.